The TC-08 thermocouple data logger is designed to measure a wide range of temperatures using any thermocouple that has a miniature thermocouple connector. Temperature data acquisition with the TC-08 is very easy: simply plug the TC-08 into a USB port on your computer (no external power required), connect your thermocouples, and you are ready to measure temperatures. 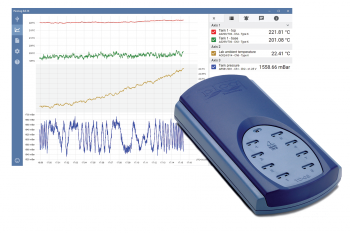 Easy-to-use PicoLog data acquisition software is supplied with the TC-08, allowing you to start measuring and recording temperatures with the minimum effort. The intuitive PicoLog user interface makes it easy to set how frequently you want to take a measurement, and the number of measurements you want to take. When selected, this control expands the graphed data under the mouse pointer in both X and Y axes each time the left mouse button is clicked. When selected, this control shrinks the graphed data under the mouse pointer in both X and Y axes each time the left mouse button is clicked. This control allows you to click and drag a rectangular selection around a portion of the graph to examine in closer detail. Using the pan control, you can browse the dataset from left to right, up and down just by clicking and dragging with the mouse. In additional to the zoom and panning controls in the user interface, it is also possible to use the mouse wheel to quickly zoom left to right by default. Zoom up and down by hovering over the Y-axis scale and using the wheel. If you have a touchscreen laptop or monitor, the zoom controls work great by using pinch and spread gestures to zoom in and out. Pan through the data from left to right, or up and down, simply by swiping one finger on the screen in the direction you wish to pan.